Introducing The Photographer’s Guide to HDR Efex Pro 2, a complete reference for Nik Software’s HDR Efex Pro 2.0 plug-in for Lightroom, Photoshop, and Aperture. I’m pleased to announce the immediate release of my latest book, The Photographer’s Guide to HDR Efex Pro 2. I have completely re-written my original guide to cover the latest version of Nik Software’s amazing HDR tone-mapping plug-in. 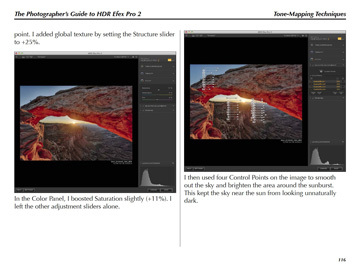 In this printable PDF guide, I’ll cover everything inside HDR Efex Pro 2 so that you’ll learn how to create amazing HDR images quickly and easily. You also get 40 custom HDR tone-mapping presets that are compatible with HDR Efex Pro 2.0. This book is over 200 pages of reference material and fine-art creative instruction that will set you on your way to making unique HDR images. I walk you through over 20 different examples of HDR tone-mapping with full color screen-shots. In this book, I’ll walk you through the creation of more than 20 examples of HDR image processing, covering a wide range of natural and artistic styles. Each example includes step by-step screenshots to show you the exact settings I used to make each image. I’ll also show you advanced techniques with Photoshop layers for creating even more interesting creative images. Along with my examples, I give you 40 of my custom preset files that you can load into your copy of HDR Efex Pro 2 to get you started making HDR images. 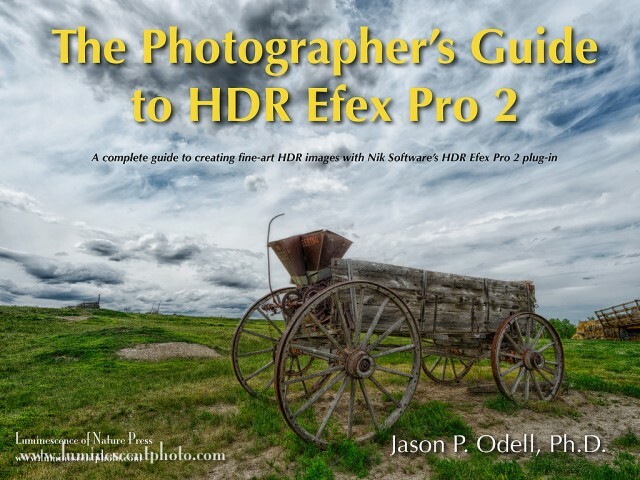 The Photographer’s Guide to HDR Efex Pro 2 is available here. The Photographer’s Guide to HDR Efex Pro 2 is delivered via download in ZIP archive format. Because this product includes supplemental files, it is not possible to download the book directly to a tablet. Download the ZIP archive to your computer, and then transfer the book PDF file to your iPad or reader tablet via the sync utility (iPad users can use iTunes). I like your ebooks, great job! I’m using PM5, but I do wish the catalog were out by now. Thanks, Kevin! It’s always a pleasure to write about products that I enjoy using. Isn’t there a discount for the ones who bought “The Complete Guide to Nik Software’s HDR Efex Pro v.1”? Are samples of the featured images available for working through the step by step examples? Thanks for a great Nik webinar today. Thanks, Bill. I don’t include the sample images simply because each HDR is a sequence of numerous image files, and there are 23 images, all of which would need a complete HDR series. The sheer size of that many files would be a download nightmare.